Ratalaika Games has announced that League of Evil is coming to Nintendo Switch on August 31, 2017 via the Nintendo eShop for $7.99 / 7.99€. 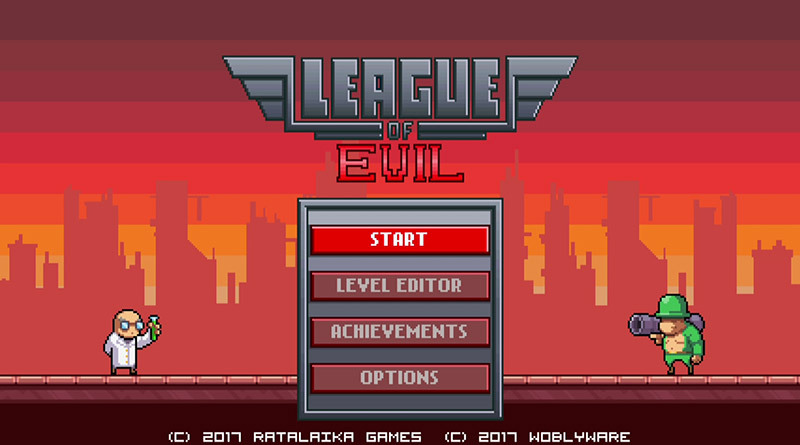 Developed by Woblyware and first brought to Steam and mobile devices, League of Evil is an action game that sees a bionic super agent take on the mission to defeat the League of Evil. Use your acrobatic skills to punch your way through levels filled with deadly traps and defeat your enemies. The world is counting on you! The Nintendo Switch version features a new and easy-to-use level editor for players to create and share custom levels online. These levels can be played on Nintendo Switch systems and on the upcoming PS Vita, PS4 and Nintendo 3DS versions, thanks to a special cross-platform online feature. Furthermore, there are plenty of custom made levels available to download for free. 140 challenging Missions in the Story Mode. Four Chapters and six different Worlds. Colorful Retro-Graphics, Cutscenes, and a Nostalgia-inducing Chiptune-Soundtrack. A comfortable Level Editor to make your own levels. Use all 50 objects and enemy types from the story mode to create your dream missions. Or simply download new ones from the League of Evil community for free. Cross-platform level sharing between Nintendo Switch, 3DS, PS Vita, and PS4. Extra Chapters for Custom Missions and Download Missions. 140 timed challenges for speedrunners.